The businesses you advise are likely facing a number of challenges in 2017. Not only is the industrial and political landscape evolving, but there are rapid advancements in technology, and continuously growing customer expectations to deal with as well. 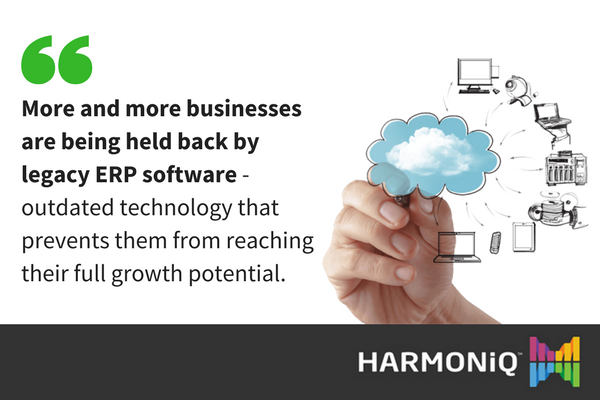 That’s why leveraging technology identified amongst the ERP trends for 2017 is so important. To overcome these challenges, businesses need to pull out all the stops to increase efficiency, grow revenue, and minimise unnecessary costs – and as an advisor, you play a big role in helping your clients succeed in this arena and enabling them to take advantage of key ERP trends for 2017. However, more and more we see businesses being held back not by lack of good advice, but by legacy ERP software – outdated technology that prevents them from reaching their full growth potential. Legacy ERP software systems can be clunky, complicated, but above all costly to maintain. Not only do companies find it difficult to upgrade their software, but it’s also almost never economically viable to do so, requiring astronomical customisation fees and a disruption in day-to-day operations. The constraints of legacy software make it nearly impossible for businesses to remain agile and adaptable to changes in the market or evolving customer needs – a necessity in 2017. But most businesses are wising up. They have realised that they no longer need outdated legacy systems to be able to get a powerful ERP platform that gives visibility and control over all aspects of the business. According to TechTarget, SMEs are increasingly realising the transformative power of flexible ERP platforms that combine both agility and functionality. Have you updated your software offerings to keep up with the ERP trends for 2017? If not, as a professional services provider, you are likely to be missing out on opportunities to serve your existing customers better and to win more clients as well. 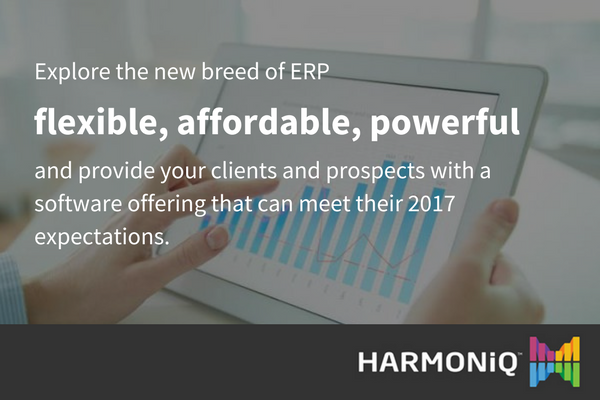 Explore the new breed of ERP – flexible, affordable, but powerful – and provide your clients and prospects with a software offering that can meet their 2017 expectations. HARMONiQ is one ERP platform that can provide your clients with an integrated platform for financials, inventory, sales and marketing. An already robust platform, HARMONiQ continues to add features that are indispensable for their users in 2017. To give you an idea of what we’ve got planned for 2017, you can browse through a small sample of the updates below. HARMONiQ Web Client – Coming very soon! You’ll get improved support for Microsoft’s cloud based implementation of Excel, Word and Outlook. The mobile platform will be made available to you on both iPhone and Android in this quarter. Battle cards will be definable based on custom SQL queries although we will plan to publish a standard set of KPIs based on feedback from our customers. You’ll now have access to an additional 3 levels of analysis to all our General ledger processing. This is an extension to the Cost Centre and Department analysis currently available, improving your ability to analyse more complex and layered businesses in the general ledger. As part of the HARMONiQ Commerce product, we will be adding the capability for Suppliers to login to their own section of a hosted HARMONiQ Commerce site to update details like due dates and expected quantities for orders placed with them. We will be adopting the HARMONiQ Commerce product for use in showroom situations. We will be introducing a new spreadsheet-style management accounts editor which will allow for even more complex calculations, and a more free-form experience for users who like to modify their management accounts layouts. In 2015, we added the ability to preview, approve, and reject custom validation rule authorisation requests via email. This year we will extend this capability to allow you to design actions that can be triggered against an item from a user’s email. For example – approving leave requests, releasing an order for picking, approving a payment run. This feature (like the email authorisation) will require the web services module. Find out more about the HARMONiQ Channel Partner Program. Download the Partner Information Pack here.